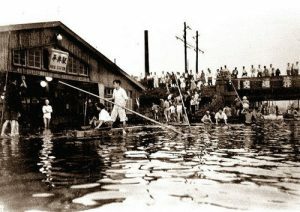 Flooding at Hirai Station, Edogawa-ku, following Typhoon Kitty in 1949. On March 30, the Tokyo Metropolitan Government issued a new flood map based on a super typhoon hitting the nation’s capital. Approximately a third of Tokyo’s 23 wards, representing 212 square kilometers, could be at risk of being flooded by a storm surge. Almost all of the flood risk zones are located in the eastern part of Tokyo which is a low-lying district. Central Tokyo, with the exception of some of the waterfront districts, and the western side of Tokyo is on elevated ground and outside of the risk area. If levees are breached, some areas in eastern Tokyo could see flood waters with a depth of over 50cm covering an area up 84 square kilometers for a week or longer. The maximum flood depth could exceed 10 meters in some zones. Sumida and Koto wards could see an average flood depth of around 7 meters. 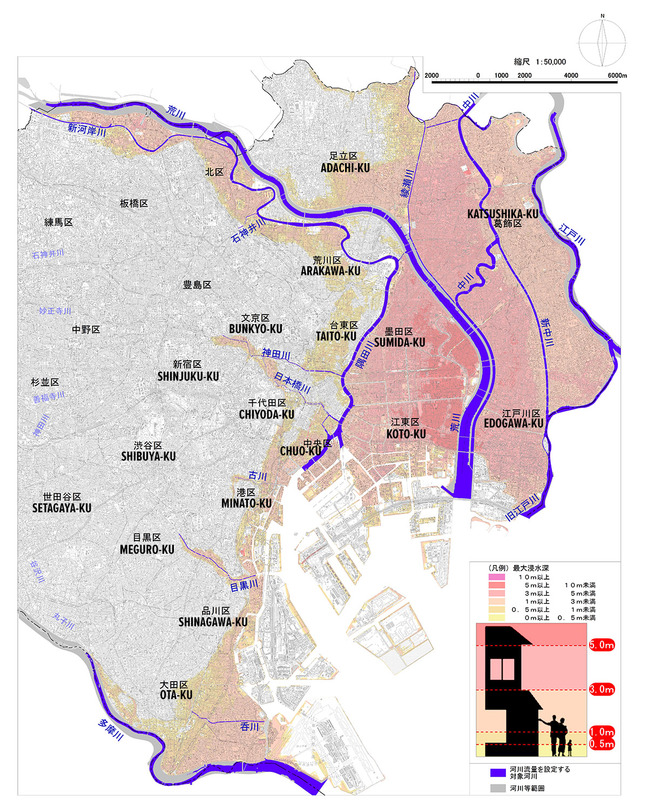 The 1 in 1,000 ~ 5,000 year worst-case flooding scenario is based on the scale of the 1934 Muroto Typhoon that made landfall in Muroto, Awaji Island and Kobe. It caused tremendous damage in Osaka. Over 3,000 people lost their lives and 200,000 were left homeless. The typhoon brought a tide of 3 ~ 4 meters which inundated 49 square kilometers of Osaka City. The simulation is also based on the speed of Typhoon Vera, or the Isewan Typhoon, which struck the Tokai region in 1959. Homes in 17 of the 23 wards would likely see flood damage in a similar typhoon. Approximatley 90% of Sumida, Katsushika, and Edogawa wards, all low-lying districts near major rivers, would be inundated. 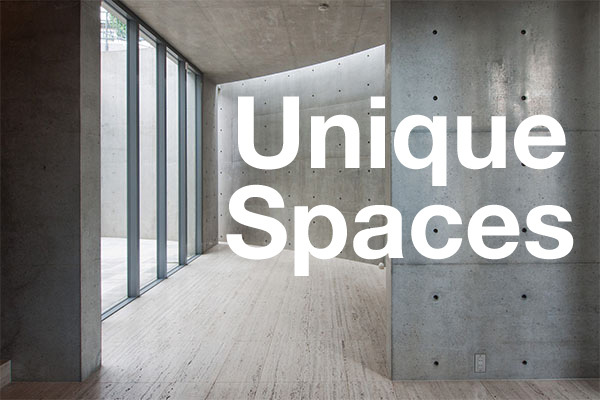 The Kameido 7 Chome address in Koto-ku, located 1.7km east of Kinshicho Station, is within a 10-meter flood risk zone. Some of the streets in this neighborhood are actually below sea level. 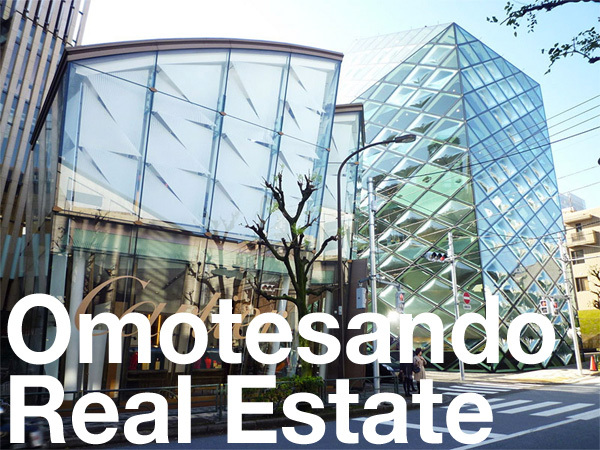 The flood risk zone also covers part of the Marunouchi business district, Shimbashi and Ginza. The daytime population of the flood risk areas is 3.95 million. Tokyo’s bayside islands of Tsukishima, Kachidoki, Toyosu and parts of Harumi could see flooding of between 0.5 ~ 3 meters. In Minato-ku, the low lying areas around Azabu Juban station and along the Furukawa River could see flooding of up to 3 meters in parts. In 2015 the national government revised the Flood Control Act, requiring local governments to create hazard maps and evacuation plans based on maximum possible storm surge heights. The Tokyo government is urging each ward to create local hazard maps. 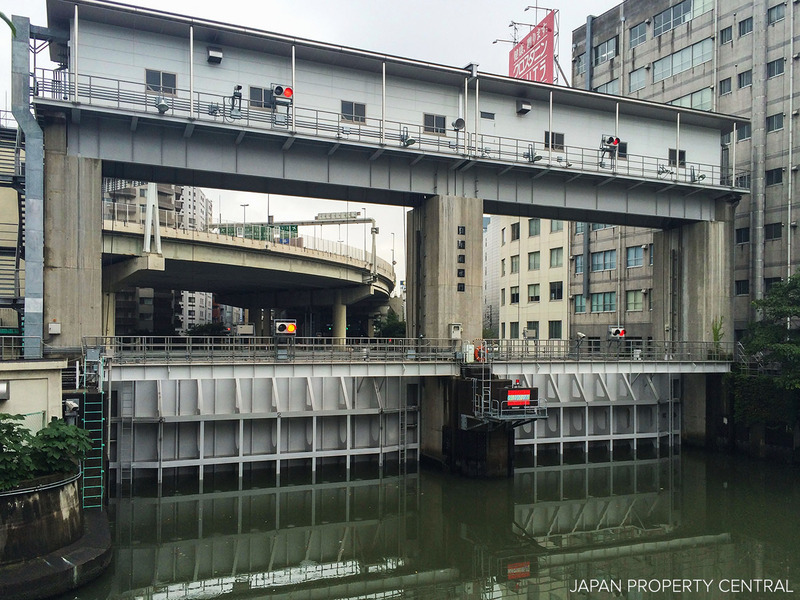 A lowered floodgate in Chuo-ku, Tokyo. Tokyo Bay is relatively shallow and in the event of a storm surge, high tides can lead to flooding along the Tama, Sumida, Arakawa and Edo rivers. The eastern side of the city includes low-lying, coastal regions that are particularly susceptible to flooding. A typhoon in September 1917 led to a storm surge that flooded Tsukuda, Tsukishima, Tsukiji, Shinagawa and Fukugawa, as well as parts of Chiba prefecture. Over 500 people died, many from drowning. In 1949, Typhoon Kitty passed over the Kanto region, causing a 3.15 meter storm surge in Tokyo Bay. Parts of Koto and Edogawa wards were flooded. Following this typhoon, the city improved its flood prevention infrastructure with tide embankments and floodgates, and has not suffered any damage from storm surges since. However, the latest flood damage simulations are based on a worst-case scenario where these levees, floodgates and pumping equipment fail to work effectively. The Nikkei Shimbun, March 30, 2018. TBS News, March 30, 2018.